to celebrate christmas i bought myself my first naginata. Jyo saku and regular saki)This sword Kashu Jyu Fujiwara Mitsuhira belongs to Jyojyosaku ranking. Blade length :　54.5cm or 21.46inches. Sori : 3.03cm or 1.19inches. 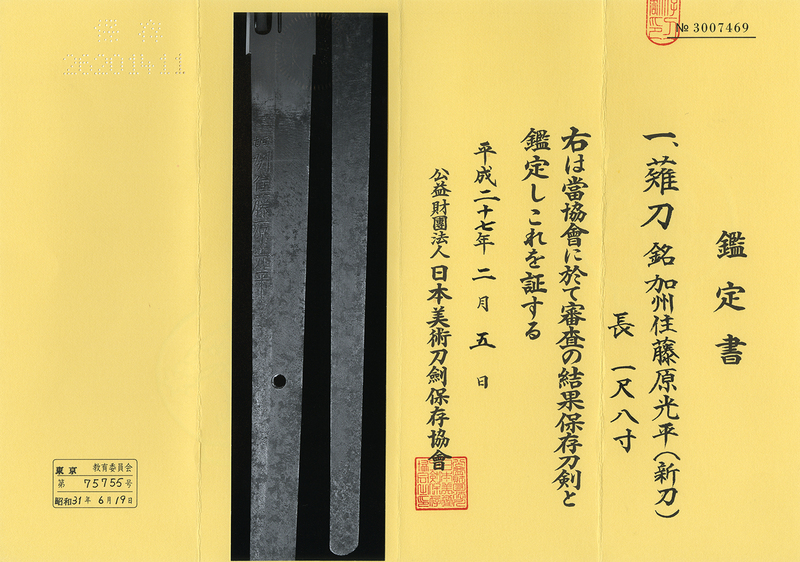 Width at the hamachi :3.1cm or 1.22inches. 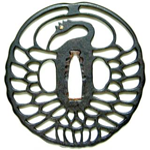 Shape: Itame hada well grained with masa hada appearing The hada pattern could be observed well. Hamon: Nie deki suguha with mixture of notare work. It is could ha with sunagashi activities. Boshi is round turn back. Special feature :Kashu Jyu Fujiwara Mitsuhira is one of Katsuie group swordsmiths and also the son of Sandai Mitsukuni. He was called Chuumemon. This naginata is wide and thick with superb jigane. It is masterpiece of Fujiwara MItsuhira. We recommend this long and thick katana. Historical Background: Koishikawa Hospital was established by the order of Tokugawa Yoshimune on Keiho 7th year(1722）. The population of Edo boosted due to massive influx of migrants from farming villages causing an outcast class in the society. This lead to Yoshimune’s order of building Koishikawa Hospital. This enabled the poors to take medical advice for free. I even learned something about the history of Kaga, the Maeda clan and the ikko ikki while i did my research about the smith. 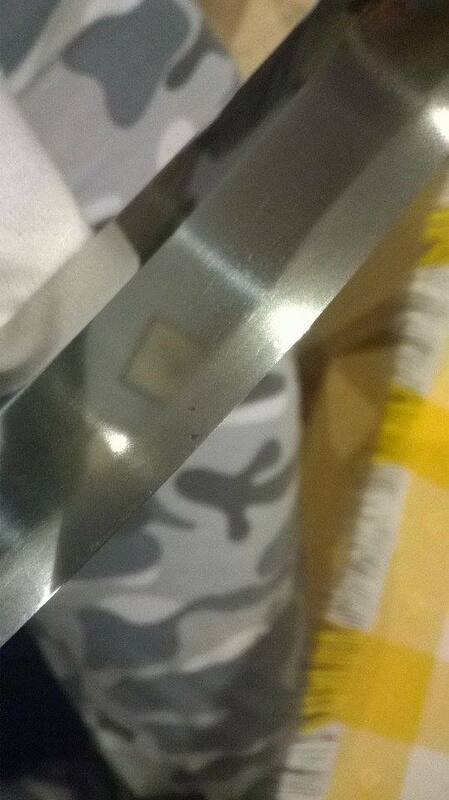 i found some nailcather in the blade. These where not visible in the pictures. They bother me a bit because quite picky in these things. The rest of the polish is in perfect condition. Anything i can do besides cleaning them? did he write " without kizu and flow".. ? May be Mike from Nihonto.eu can help..
no actually he didn´t. You can find the original text in the first post. Yeah, i could ask Mike, but also I calmed down a little bit. 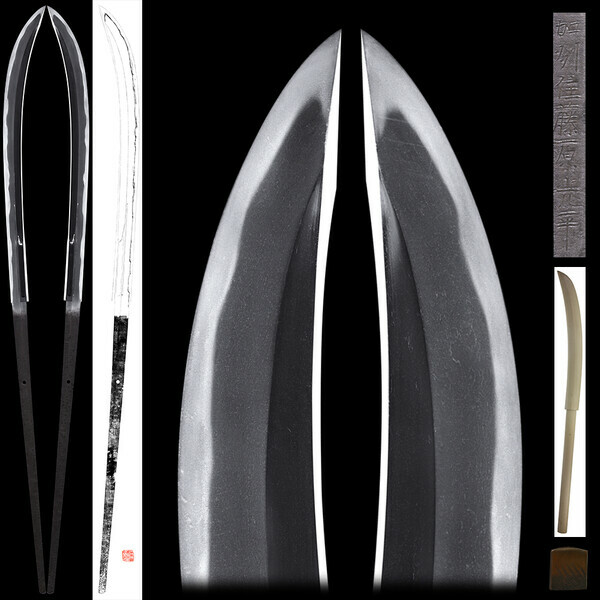 The Naginata is in 99% perfect polish and i got an discount on the original price so i think that i can live with it. My girlfriend has a better collectors mentality than i have. She said: "The damn thing is 300 years old! What do you expect?" :D.
I like her. Heed her advise. It takes away more metal during polish to remove every single nail catcher. you can still enjoy it as is. Personally I wouldn't worry about it. thanks for all the comments so far. It is always the same thing, when i get a new piece. I find something anyone else would not even bother to mention and turn into "Hulk-mode". I really really like the blade (and my girlfriend )! The polish is great, the fit in the shirasaya is perfect and it is papered. So you were the one that bought it. I was looking for it and was going to buy it but, you got it so I just bought the Kiyomitsu Tanto from them. Now I am saving for the Tadahiro naginata. The naginata's that they have are just beautiful. Congrats on a great blade. i was quicker this time, normally it is the other way around . Yeah, the blade is packed with activity and on the long side for a naginata. The one from Tadahiro... way out of my Price range . Wish you luck with that one and maybe you can get an discount (i got one), you just have to ask nicely. They are very good about discounts. I bought a Yari from them and got 25000 yen off and I just got a Kiyomitsu Tonto with a 35000 yen discount. I wait until they have been on for awhile and then make an offer. So far they have not said no. So...if my end of year bonus/commission is good, that naginata will be mine. enjoy yours, I think the naginata is the most interesting blade out there.